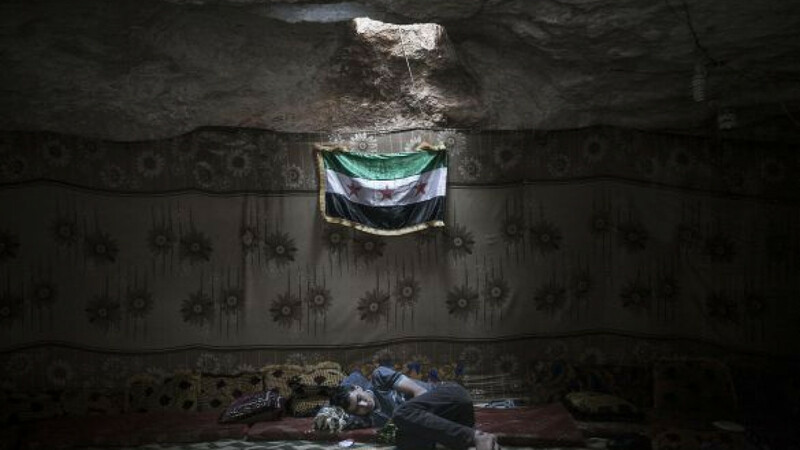 A Syrian opposition fighter resting in a cave in the Idlib province Tuesday. The opposition has urged swift action. Russia denounced United Nations investigators' findings on a poison gas attack in Syria as preconceived and tainted by politics on Wednesday, stepping up its criticism of a report that Western nations said proved Syrian President Bashar Assad's forces were responsible. Russia, which has veto power in the UN Security Council, could cite such doubts about proof of culpability in opposing future efforts by the U.S., Britain and France to punish Syria for any violations of a deal to abandon chemical weapons. "We are disappointed, to put it mildly, about the approach taken by the UN secretariat and the UN inspectors, who prepared the report selectively and incompletely," Deputy Foreign Minister Sergei Ryabkov told the state-run Russian news agency RIA Novosti in Damascus. "Without receiving a full picture of what is happening here, it is impossible to call the nature of the conclusions reached by the UN experts … anything but politicized, preconceived and one-sided," said Ryabkov, who met Syrian Foreign Minister Walid al-Moualem late Tuesday and Assad on Wednesday. The report issued Monday confirmed that the nerve agent sarin was used in the Aug. 21 attack but did not assign blame. Britain, France and the U.S. said it confirmed that Syria's government, not rebels as Russia has suggested, was behind it. Foreign Minister Sergei Lavrov said Tuesday the investigation was incomplete without examination of evidence from other sources and that suspicions of chemical use after Aug. 21 should also be investigated. Ryabkov said Syrian authorities had given him alleged evidence of chemical weapons use by Assad's opponents. The stark disagreement over blame for the attack may complicate discussions among Security Council members — Russia, China, the U.S., Britain and France — over a Western-drafted resolution to eliminate Syria's chemical weapons. "We are surprised by Russia's attitude because they are calling into question not the report, but the objectivity of the inspectors," French Foreign Minister Laurent Fabius said in Paris on Wednesday. "I don't think anybody can call into question inspectors that have been appointed by the UN," said Fabius, who met Lavrov in Moscow on Tuesday and said several aspects of the UN report clearly pointed to Syrian government involvement. Russia has been Assad's most powerful backer during the conflict that has killed more than 100,000 people since 2011, delivering weapons and — with China — blocking Western efforts to use the Security Council's clout to pressure his government. Moscow argues that the danger emanates from rebels, many of whom harbor militant Islamist ambitions for Syria that could ultimately pose a threat both to Russia, which is fighting against Islamist militants on its southern fringe, and the West. In his meeting with Ryabkov, Assad voiced appreciation "for Russia's stances in support of Syria in the face of the vicious attack and … terrorism, which is backed by Western, regional and Arab forces," Syrian state news agency SANA said. The draft resolution is intended to support a U.S.-Russian deal reached Saturday calling for Syria to account for its chemical weapons within a week and for their destruction by mid-2014. The accord was based on a Russian proposal accepted by Assad. The deal halted efforts by U.S. President Barack Obama to win Congressional approval for military action to punish Assad for the gas attack, which the U.S. says killed more than 1,400 people in rebel-held areas. U.S. Secretary of State John Kerry called on Tuesday for a resolution with the strength to force compliance from Assad. Diplomats said the current U.S.-British-French draft was written so that its provisions were under Chapter 7 of the UN charter, which covers Security Council authority to enforce its decisions with measures such as sanctions or force. But Russia has made clear that it believed authorization of the use of force would require a second resolution to be introduced if the Syrian government or its opponents were found to have violated the country's commitments on chemical weapons.